My cousin and I garden, well, she gardens and I watch (does that count)? She works as I sip my ice water in the nearby shade. That, is, still gardening, right? Anyhoo, over the years she has produced some of the most beautiful looking spaces between her plants and garden decorations that I have ever seen. This time it was my turn to help in a way I have never been able to before. I gifted her two awe inspiring garden decorations from Precious Moments. They have the loveliest garden pieces. I have used affiliate links. In the event that you purchase something I will receive a small commission. Now through June 6th you can receive a free gift with a $50. purchase. Very easy to do with their beautiful choices! Sherry, my cousin, is always busy with something. She has an Associates, Bachelors and Masters degree, she teaches other adults to become awesome nurses, attends and helps at her church, not to mention, helping with every event the family has and does her own crafting, cooking, baking which is fabulous! That is the reason for the sweet “Slow Down,” Resin Deck and Garden Planter. I'm always telling her to slow down and smell the flowers or watch the amazing birds. It is an adorable turtle planter. This planter is approximately 7.25 inches high x 6 inch diameter opening, it will Hold about one gallon of potting soil. It was made to display your favorite flowers. When this arrived it was so much bigger than I had expected. 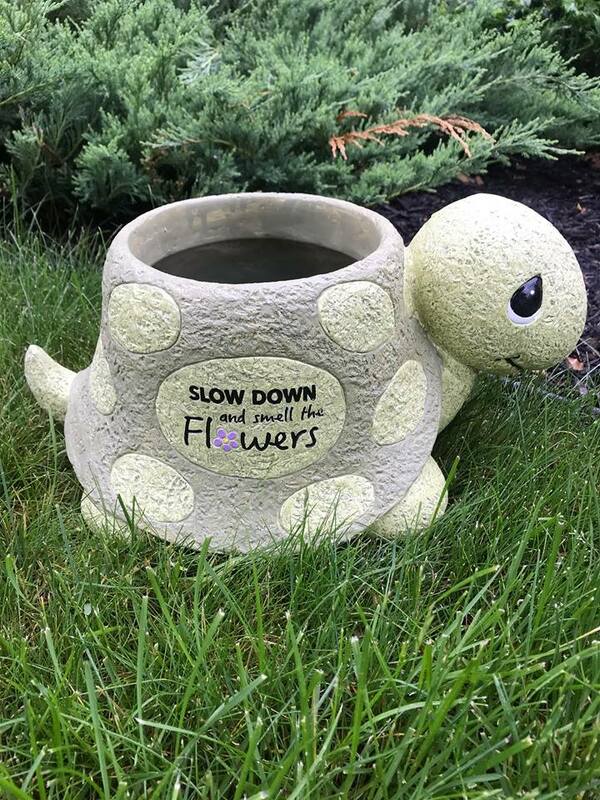 This “Slow Down” Deck and Garden Planter, Resin was crafted in durable, resilient and lightweight resin and has a drainage hole on the bottom for easy planting plus placement. The resin garden planter is beautifully detailed from the friendly smile to the words on the front of the planter that says "Slow Down and smell the flowers" A small fairy garden would be the perfect compliment to the “Slow Down” Deck and Garden Planter. Precious Moments are vintage, antique and collectible handmade figurines, limited editions, ornaments, decor and more. There is something to choose from for almost every occasion. Precious Moments are inspirational, a meaningful gift to be treasured forever. They are the world's most recognized inspirational brand. The “Faithful a n d Feathered” Bird Feeder, Resin from Precious Moments is a 24 inch high angel. 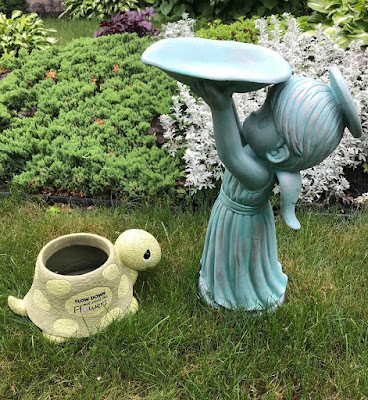 This beautiful angel was crafted with durable resin with a verdigris finish she holds a basin up for the benefit of our feathered friends that are flying about. This precious resin angel bird feeder is beautifully detailed from the halo on her head to the cute little toes that peek out from beneath her gown. She holds the bird feeder above her head. The “Faithful a n d Feathered” Bird Feeder, Resin was inspired by the angels that line the walkways to the Precious Moments Chapel. This amazing and uplifting design will bring peace and joy to any garden. Precious Moments began more than three decades ago by a man of deep personal faith and conviction. Sam Butcher, began drawing the endearing teardrop-eyed children he called Precious Moments, as gifts for family and friends. Precious Moments artwork is among the most recognized art in the world today. Precious Moments shares messages of loving, caring and sharing with collectors from around the globe.The success of the Precious Moments figurines was amazing, yet Sam never lost touch with his original purpose to create art which combined his heartfelt emotions with his abiding faith. The collection is now thousands of pieces, with new introductions offered each year. Members of collector's clubs continue to be found throughout the world. Furthermore, since its opening in 1989, Precious Moments Park in Carthage, Missouri has welcomed approximately 400,000 visitors every year. Precious Moments has an item to celebrate every occasion, Mother's Day, Father's Day, Grandparent's Day, Easter, Religious, Thank You gifts and don't forget the graduates! You can choose from themes such as a date, friendship, Love, Sports, hobbies plus more. Let someone know exactly how special they are by choosing a gift from Precious Moments. When you visit preciousmoments.com you can request a catalog to see all their amazing adorable products. You can even learn how to earn Precious Moments reward points. These are gifts your loved ones will treasure a lifetime! 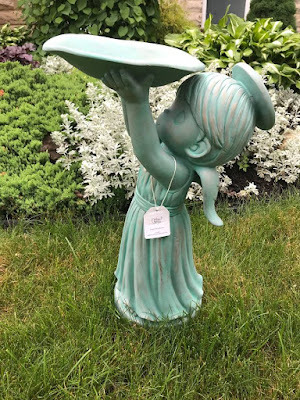 I love to garden to and I am always looking for little figurines to add to my garden, These ones are so cute! I love how you talk about your cousin gardening and you watching - I think that would be the type of gardener I would be! I love the pot - so cute and it has a good message on! Slow down an smell the flowers- reminds us to take time and enjoy nature! Oh, What pretty little garden decorations. I'm sure she loved adding them to her garden. Such cute garden decorations. That little turtle is so cute. I absolutely love to garden!!! I find it so relaxing and a great way to keep stress away! I love these adorable decor for the garden!! How cute! I remember Precious Moments. I remember getting a few ornaments of this type as a kid. What a lovely gesture to gift some of these lovely ornaments to your cousin. They look really lovely and I am sure she is really pleased. Precious Moments seems like a wonderful site. What an adorable decor and garden. I love gardening, it is a stress buster for me. Precious moments sounds like a really nice site, will check it. That bird feeder is just adorable! These items really make me inspired to grow a garden again. I really love the smell of nature from the comfort of your own backyard in a modernized city.